Earlier in 2012, I decided to move WP Mayor to the WP Engine WordPress managed hosting platform. There were a couple of reasons for doing this, the main one being a desired increase in loading speed. Now after a few months working with WP Engine, it’s a good time to share my experience in this WP Engine hosting review. Before migrating to WP Engine, WP Mayor was hosted on a shared platform (HostNine). I was very happy with the service provided by HostNine, but a shared platform always has limits and therefore I felt that as the traffic grew and grew, I had to move on to a more robust hosting solution. After some research and recommendations I identified WP Engine as being our ideal hosting platform, and got myself an account. I considered the first three plugins as being fundamental for running WPMayor, and Broken Link Checker had also served me very well for a number of years. Therefore my reflex reaction was a feeling of disappointment, however it soon started to make sense after I read the articles about WP Engine’s security environment. I was also very glad to read that caching and backups are core elements of the WP Engine hosting service, so actually I wouldn’t be losing anything by disabling W3 Total Cache and BackupBuddy, as their functionality would be replaced by the native WP Engine systems. The problem with the YARPP plugin, as I learnt, is that it can destroy a site’s performance due to the way it indexes the posts and pages on the site in order to determine relationships between them. Thankfully, there are two great alternatives: nRelate and wordnik. I ended up going with nRelate. Apart from a better experience for WP Mayor’s visitors, one big plus for me was the fact that the WordPress admin dashboard now behaved more responsively, shaving off a considerable chunk of my daily maintenance and writing time. This is an overlooked aspect when thinking about hosting, but it’s worth having a look at the load times of your admin pages. The best thing about WP Engine is probably the hosting features they fit into their account. First of all you should know that WP Engine do not provide any email hosting, so you have to take that into account when moving from a shared hosting environment. I’ve always used Gmail for email so it wasn’t a problem for me. WP Engine focus purely on WordPress hosting, and this precise focus gives them the ability to be so good at what they do. WP Engine hosting includes backups as well as caching facilities, so you don’t need to use any external plugins and worry if backups are being taken. Everything is handled by the WP Engine platform, and you can request backups when needed. Another incredibly valuable feature, and one I’ve never encountered on any other hosting platform, is the staging area. Whenever I need to update WordPress plugins, I first create a clone of my site, and make the upgrades there. Once I am sure that they work, I apply them to the live website. Therefore the staging area is that place where you can experiment and not worry about breaking things. I also use it when testing new changes to my site’s theme, for example. It is probably my favourite feature about hosting with WP Engine. Oh, the staging area can be created from the dashboard with the click of a button, it’s that simple! For the more technical readers, you will be pleased to know that WP Engine is the first host to offer WordPress deployment via Git, see git.wpengine.com. It is one of the features that really distinguishes WP Engine from other hosting providers for me. WP Engine is also the only hosting company who bundles a CDN as part of the base service. So this awesome technology that’s normally reserved for large sites who want to spend a bunch of money, is now accessible to everyone. Another great thing about WP Engine is their platform’s ability to handle peak moments of traffic to your site. Let’s say you blog about the entertainment business and the Grammies or Oscars are on, you will probably experience a high spike of traffic while they’re on, and WP Engine will handle that spike automatically, whereas if you hosted on shared hosting or even on a VPS, you will probably have your server overload and make your site unavailable. When you pack so many features into a hosting package, the price is bound to rise, however I think that WP Engine’s pricing plans are very fair. At the moment they are also running a special promotion in which you get two months free when pre paying for a whole year. Prices start from $29/month for sites that have up to 25,000 visits per month, and an extra $19 if you want to use a CDN. That’s at least around 3 times what you would pay for a shared hosting account, but you’ll be getting a totally different service with WP Engine, so the prices make sense. If your blog is making money and you have a good number of visitors, it is definitely worthwhile price-wise to opt for WP Engine hosting. WP Engine use Zen Desk for their support system, and it works very nicely. Their response times are amazing and their staff are knowledgeable and helpful. A negative aspect for me was the fact that the support staff are only available during US working hours (Monday through Friday 9 am through 6 pm CST), thus you don’t have the 24/7 support usually offered by other hosting companies. That means that being in the European timezone, I have to wait quite a number of hours for a problem to be addressed. To be fair, they do have an emergency helpline for phone support (1-877-973-6446) in really urgent cases, but I would still prefer to have 24/7 email support. Update: Austin Gunter from WP Engine has pointed out in the comments below that they are hiring staff for 24/7 support in 2013, which is a great step forward in my opinion. I highly recommend WP Engine’s managed WordPress hosting services. With WP Mayor I haven’t had any significant problems since migrating to their hosting platform. Uptime has been excellent, and the guys at support have always gone out of their way to help me whenever I had any questions or trouble with the site. Hosting with WP Engine, apart from bringing a tremendous speed boost to my site, is also proving to be an excellent learning experience, as I have learnt a great deal about WordPress security and speed tuning from their well-written documentation found in the ‘Support Garage‘. If you’re thinking of making a switch from a shared host to high quality managed WordPress hosting, WP Engine is what you are looking for. Let us know what your experience with WP Engine is like below, and feel free to post any questions about how WP Engine works, I’ll do my best to reply based on my experience with them. No doubt WP Engine comes with many features that we can’t find elsewhere, but what sets me back is the alarming high costs. The pricing is not a “bit costlier” but I can use the word “overpriced”. Of course not everyone will agree to this, when we take in to account the costs from Hostgator, Dreamhost and others. That is a valid doubt Saqib, and one I tried to address in this post. Like I said, while it’s true that you will be paying around 3x what you’d pay for shared hosting (Hostgator, Dreamhost etc. ), you’re really getting something quite superior. WP Engine’s hosting packages should be compared with the prices for a VPS, which start from $20 with the big hosts like Linode, VPS.net etc. When you consider that you are getting a fully managed hosting service, and including goodies such as backups, caching, plugin curating, WordPress updates, WordPress-centric support, and the staging area, I think it’s well worth paying that little bit more. The 10-site package is of even greater value, you pay $99 but can host up to 10 sites. Dividing that cost between your sites, that would be $9.99 for each site, very close to what you’d pay for an inferior shared hosting service. Still think WP Engine is overpriced? That seems to be the most common hangup that I hear about WP Engine. The thing is, I find that WP Engine saves me time each and every month. That’s time that I can be using elsewhere. And they give me peace of mind – I know my websites can handle traffic spikes, have daily backups scheduled, etc. Obviously they don’t fit the hosting bill for each and every website, but they do an excellent job for those that do. Well said Ryan. Many people are only interested in the speed increase, or better uptime, but there is so much more to a great hosting experience. Thanks for the review. From where I’m sitting, it looks like you were focused on achieving a balanced perspective of WP Engine’s strengths as well as our weaknesses. Thanks for the review! I wanted to add a few things, and then also respond to the commenters so far! In terms of support, you’re absolutely right that up till now, we haven’t offered 24/7 support, but we always have on-call admins and developers who can be raised in the middle of the night, plied with the darkest roasts of espresso, and who will go to troubleshooting your site quickly, regardless of the time, or the time zone. In 2013, one of our top priorities is hiring out to 24/7 support. Obviously, we’ll continue to do that in the same deliberate way, and only hire awesome people that are excellent for you to work with, and who also know their WordPress. One of our founders and the CEO, Jason Cohen, wrote about those values here: http://wpengine.com/2012/11/creating-a-company-culture-that-thrills-customers-at-wp-engine/. Rest assured that as we get to achieving 24/7 support, you’ll continue to get ticket responses within half an hour, from awesome, friendly engineers. @Saquib: You ask a great question, and it’s a common one. Frankly, the generic answer is that managed hosting may not be the right choice for people who are primarily concerned about getting the cheapest hosting. Still other folks pay for a dedicated server or a VPS that they self-manage (which isn’t cheap), because they like doing all the sysadmin stuff. But if you want a cost-breakdown of what goes into $30 a month for hosting, you can check out wpengine.com/expensive. @Chris: you’re definitely right that only the exceptions get tons of traffic. But scalability isn’t the only concern of our customers. We host a lot of sites for large companies who pay for a security guarantee so they know that no matter what, we’re patrolling the security of their site so they don’t have to. Or they go for incredibly fast page-load times which dramatically affect their SEO, so that the traffic they DO get is more likely to convert. Sometimes less is more, but your site still has to represent your brand. Thanks for your input Austin, 24/7 support is a fantastic move for all of us who aren’t in the US timezone. I’ve heard a good number of people arguing that they won’t join WP Engine purely for the reason that normal email support is not offered for their timezone, so I’m sure this will reap good dividends business-wise for WP Engine. Good read. Although I don’t use them personally, I think their service is worth every penny. That said, I see why people are afraid to pull the trigger. I can’t remember exactly where I saw this, but there was an article stating that roughly 85% of WordPress blogs get less than 1,000 hits per day. I’m not sure how accurate that is, but if it’s true I guess that just isn’t enough traffic for the average blogger to spend that kind of money. P.S. BackupBuddy is awesome though!! That is true, most websites who have low traffic will find it hard to justify the cost of hosting with premium hosting providers such as WP Engine. On the other hand, speed and security might be top priorities and that would justify the extra cost, as Austin pointed out. If you have a low traffic but high converting website, say selling informational products, hopefully you’ll be making enough money to make the price of hosting WP Engine well within budget. For all e-commerce sites, speed and security are of paramount importance, and that’s another case where I would not host with a shared host regardless of traffic. I would also like to point out that while BackupBuddy is an awesome plugin in its own right, WP Engine have their own proprietary backup system, so you won’t need BackupBuddy when hosting with them. In fact, it is disallowed on WP Engine hosted websites, since it is redundant and also consumes server resources unnecessarily. If you’re not hosting with WP Engine, on the other hand, BackupBuddy is one of the best plugins you can install. Great Review Jean. I don’t think I could write it better myself. I had the same reservations about losing the exact same 4 plugins (well, caching, DB backup, Broken Links and Related Posts… I had used slightly different DB and Caching plugins). I quickly found a better related posts plugin called Related Posts Thumbnails. The other items you mention are also things I had to sort through and I have also been frustrated with their limited support. Case in point, the time I accidentally wiped out my wp-config file and they never responded to my request for restoring. I had to delete and start over from scratch. The other frustration I have is with their homepage. It’s completely unfriendly for existing customers because it’s geared entirely toward acquiring new users. Overall I’m quite happy with my 10 site developer pack. Thanks for your comment Jeff. I agree with you, the homepage is due for a revamp, many times have I gone directly to the site and failed to locate a clear ‘Support’ section. I’ve now gotten used to accessing support from within the Dashboard, but I would still improve the homepage itself. I haven’t actually found a good-enough replacement to the Broken Link Checker plugin, I know there are the Google webmaster tools, but Broken Link Checker is much better for finding and fixing links directly from the dashboard. It’s a small compromise to make however in the grand scheme of things, and it wasn’t something that made me think twice about going for WP Engine. The 10 site developer pack is probably the best deal if you’re doing client work. That way you can even resell the hosting service at a higher price (possibly including an extra service from your end). Jeff, I’m sorry to hear that you didn’t get a response back with your support issue! That’s definitely not in line with how we normally see support go! In fact, that’s the exact opposite of what I typically hear. It may be water under the bridge at this point, but please don’t hesitate to email me if I can help out with this, or anything else you may run into in the future: [email protected]. Thanks for the offer Austin – I am sure it was just a small lapse. Other times I needed a response it did come in timely. This time just happened to be when I needed it the most. Fortunately, I was able to fix the problem. Will keep you in mind for next time if this happens. Very indepth review I think WPEngine is one of the best WordPress hosting but costs much higher than VPS hosting. Great review. Their support has been awesome for me. Since I moved to them I ran into a lot less hosting issues related to WP which I think is a direct collation to them optimization their servers for WP. I take great comfort in them doing only WP. IMO WP Engine and Zippy Kid offer the best WP only solutions right now. I share the same concern as most of you do…which is there are certain plugins that are bad. But as most of you learned, there are very good reasons why they are banned and frankly will not allow you to scale very well at all. Keep Rocking WP WP Engine! Shout Out to Trafton for getting me hooked on WP Engine! If you guys have any other questions about their services and want the opinion of a customer, hit me up on twitter @mikezielonka. That’s great Mike, good to hear that others have had the same experience with WP Engine. I definitely would like to try WP Engine for couples unmanaged domains. Using shared hosting is good but when it grow bigger, lots of downtime will happen. Time to try another hosting packages. The choices are VPS or Managed hosting just like WP engine. In the end, both of the choice will be replaced by Dedicated hosting or even dedicated server. The only question which bugging me is: whether WP engine is dedicated hosting with low prices or just ‘managed hosting’? Hey Arick, I think there is a 3rd option. We’ve got all the benefits of a dedicated host, but the difference is in how we manage your servers for the scalability and security of WordPress. You *could* have a dedicated box, but we’re actually able to charge less because we run our servers *very* efficiently, and at scale! I couldn’t agree with you more – I host with WPEngine and I won’t be going back to shared hosting anytime soon. 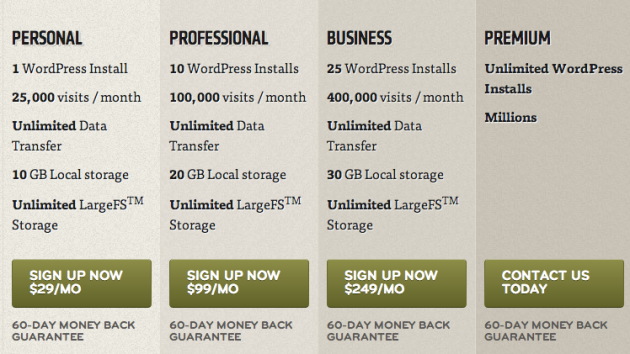 Sure, it’s a bit more per month, but it’s really not that bad when you think of it as a fully managed WordPress host. They’ve updated WordPress for, did some tuning on my theme just because, and generally have pretty awesome support. Speed and load times are excellent and were worth the increase in price by themselves in my opinion. I’m using WPEngine for almost a year and I couldn’t be happier. A start I got a little afraid about the price, but now I cant see any other solution for my host. Fast, secure and excellent uptime. EDIT: I’m using WPEngine for almost a year and I couldn’t be happier. At start I got a little afraid about the price, but now I cant see any other solution for my host. Fast, secure and excellent uptime. I’m sure you made the right choice Satish. On the support: agree that it is a pity that it is not totally 24/7. On the other hand, they are tremendously responsive during their office hours and even outside those you can usually get hold of the emergency support. Definitely agree, they’re super helpful. Super fast hosting, and nothing short of that. So happy that I switched my real estate website over to WP Engine several months ago. Interesting post and comments. I have been researching, and WP Engine were most definitely my first choice for my own website’s needs, UNTIL I tried to reach their sales department (ready to buy a year in advance and initiate the migration of my website to their servers). Three times throughout the day I sat through long hold times only to end up having no choice, but to leave a voice message – which so far 10 hours after the first, has not been returned. This is quite worrisome when sales are usually MORE eager to speak with you than technicians. After reading the Austin Gunter’s 2012 reply about adding 24/7 phone support in 2013 (and it is now November 29, 2013) I am more alarmed about the lack of response. Shame, I really thought they would be the solution. Clearly not. Thanks for the feedback Julie. I agree with you that 24/7 support should be part of the WP Engine package by now, I find it really surprising that they haven’t added it yet. On the other hand they did add Live Chat which is most helpful in resolving issues quickly. Having said that I think you were unlucky, maybe they were a bit short on staff today, not sure why they’d leave you waiting in that way. They’re very active on Twitter though and you’ll surely get their attention if you tweet out to them. If you’d like I can also alert them personally. I bet they’ll be more than ready to make it up for you and wow you with their service. Yes please, I would love for it to work out. Ok Julie, I’ll get hold of someone to help you out! I’m with WP Engine and I want to apologize for the lack of a positive experience that you had with us. I’m assuming you were calling on Black Friday, one of the busiest days for any sort of business, so I can fully understand how you must have been pulled in a million directions. I’m on call for WP Engine support all Thanksgiving weekend, so I can personally relate. We have seen a spike in sales requests in the past 48 hours, and while we have a growing sales team, we’ve erred on the side of hiring more support than sales most of the time, which might have meant we weren’t able to return your call yesterday. I’d like to follow up with your message directly so that I can escalate this to our sales team and have them reach out to you first thing Monday morning! If you wouldn’t mind, please send me an email directly, [email protected], include a bit of info about your site, and I’ll personally get the ball rolling for you. Thank you so much for writing here, and offering us feedback. That helps us get better as a company. In no way am I representing WPE, I am just a customer. But what you say Julie (and Jean) surprises me. I am already a customer so I don’t have much contact with sales, so no opinion on that. live chat is (unfortunately) only available during (US) office hours. HOWEVER, they do have 24/7 phone support. At least that is my experience. I have at a few occasions had reason to contact them urgently during my daytime (central Europe) which is in the middle of the night their time. They do have a 24/7 phone number and I have been able to reach a live tech person in the middle of (their) night. Not a top level expert support guy of course, but at least someone who did take ownership of the problem and made efforts to resolve it. Usually, if it is not very urgent, I use email (Zendesk actually) to contact support and in 9 cases out of ten (or better) I get very prompt answers. Thanks for clarifying that Per, phone support is indeed 24/7, I was referring to live chat and ticketing which is not yet 24/7. I’m still in the startup stage of one of my businesses which means I am still wearing most of the “hats”, working 12 hour days, and that makes my time my most highly valued commodity – I called that number 3 x during the busiest sales day of the year, and they not only kept me on hold for 5 minutes each time, I then ended up with a voice mail at the end of it. I went through this process 3 times, left two messages and received NO call back as promised, none, nada, nothing. I even tweeted them as Jean recommended, and no reply. The whole point of paying the high price of a managed hosting company’s fees is to be able to delegate part of what I have to manage within the company to the most capable person and/or company in order to save my time for more pressing matters that need my attention specifically. I fail to see how wasting my time is either confidence inspiring, or more importantly fulfilling any part of the service they are supposedly offering? I am extremely disappointed, because I did a LOT of research before trying to contact them. It would have been their easiest sell ever, the sales people didn’t even have to do any work – all they had to do was return my call in a timely manner! What an appalling way to run a business. The only thing they have is one blog article that mentions a dozen or so plugins specifically for ecommerce sites. There is a real opportunity to actually make a directory of tested, proven, useful, stable, well-documented, well-supported plugins that make WP great. ANYTHING would be better than the mess that is wordpress.org/plugins. Chuck, I’m completely with you with regards to 24/7 chat support. I’ve been reiterating this point with the WP Engine guys for quite some time, hopefully they will implement this soon. With regards to the curated plugins & themes feature, the post is indeed very limited, however if you ask support staff for a recommendation they’ll usually give you an informed suggestion. Despite these two points, WP Engine remains one of my favourite hosts and the one host I turn to when I have an important site and I need peace of mind. 1) We’ll suggest the best plugins based on our own experiences. We love working with the WordPress community and third party plugin developers to make sure you don’t waste time trying to find the best WordPress plugin. Me: I’m trying to find a plugin that will let me take an external RSS feed for a podcast, and display it using the media enclosures as links. I’ve looked at several plugins but can’t find anything that does this. It’s odd, because SimplePie can do that, and that’s what powers WordPress’ RSS parsing. What do you recommend? Support: That’s something I don’t have any experience with personally. And no one here has ever done anything like that. Support: Haha good point. But you can’t expect us to literally know everything. Me: No, just stuff related to WordPress. Me again: So do you or someone else there have any experience with SimplePie? Support: Nope. That’s nothing I’ve ever heard talked about around here. The support chat ended with: How likely would you be to recommend WPEngine to your friends? Oh dear, that’s not what I’d expect from an interaction with WP Engine support staff. The line about SimplePie really left me speechless. You might not expect someone to know everything about WordPress, but SimplePie is a core class in WordPress, and they should know about that for sure. Also, if this particular person couldn’t help you due to lack of knowledge in the area, he could have at least tried to search or have someone else help him out. Since you mentioned RSS, I happen to be the developer of a very popular RSS import plugin, check it out at http://www.wprssaggregator.com and let me know if we could help you out with that task. Jean, thanks for the reply. I actually did check out WP RSS Aggregator, and I was very impressed with how well-built and well documented it is. Nicely done! I wasn’t sure however if it would do what I wanted, or if I need to purchase an add-on for it. Perhaps you could tell me if this is possible? Here’s a link to what I’m trying to do: http://tny.cz/f01b00a7 (it just shows a snippet from my RSS 2.0 feed and then the basic code I would like to transform it into a WP Post).